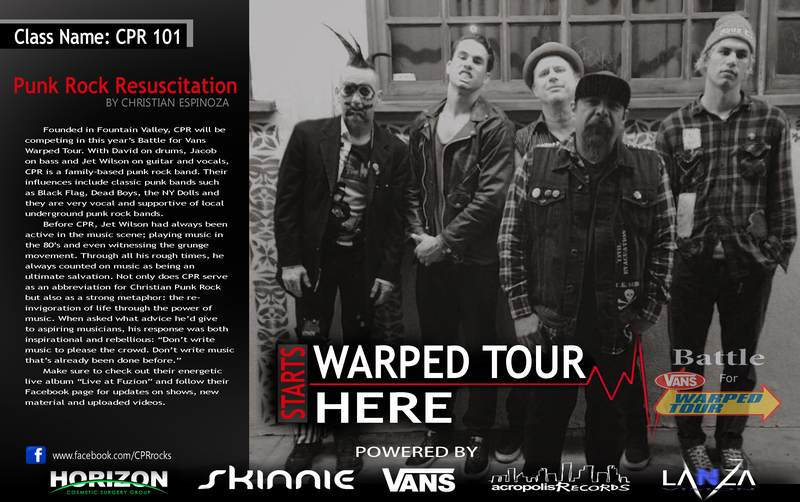 Founded in Fountain Valley, CPR will be competing in this year’s Battle for Vans Warped Tour. With David on drums, Jacob on bass, Jimmy McFinn on rhythm guitar, and Jet Wilson on guitar and vocals. CPR is a family-based punk rock band. Their influences include classic punk bands such as Black Flag, Dead Boys, the NY Dolls and they are very vocal and supportive of local underground punk rock bands. Make sure to check out their energetic live album “Live at Fuzion” and follow their Facebook page for updates on shows, new material and uploaded videos.